Miss Edna's Place: Wanna Go Climbing? Good morning. Tis a bit gray today, but the temps are warmer. I can dig this! I know we still have some Winter left, but it feels so good to have a Spring day now and then. Actually, Spring is only thirty three days away now. Woo Hoo! Remember yesterday I said that I was waiting for one more big bill? Well, I spoke too soon. The mailman brought it to me shortly after I finished my blog. Well, at least it's out of the way now, and that's one bill I won't have to pay again. Daughter Deanne came by yesterday with the cutest miniature pink rose plant in a red lady bug pot.. Oh my it is so pretty. I'll take a photo of it to share tomorrow. Thank you Deanne, I love it. This one will sit out on the porch all Spring and Summer so that I can enjoy it. My friend Mary Ann sent me some awesome images of different places around the world. I'd like to share a few of them with you. This first one is called Sheeps Highway in Ireland. 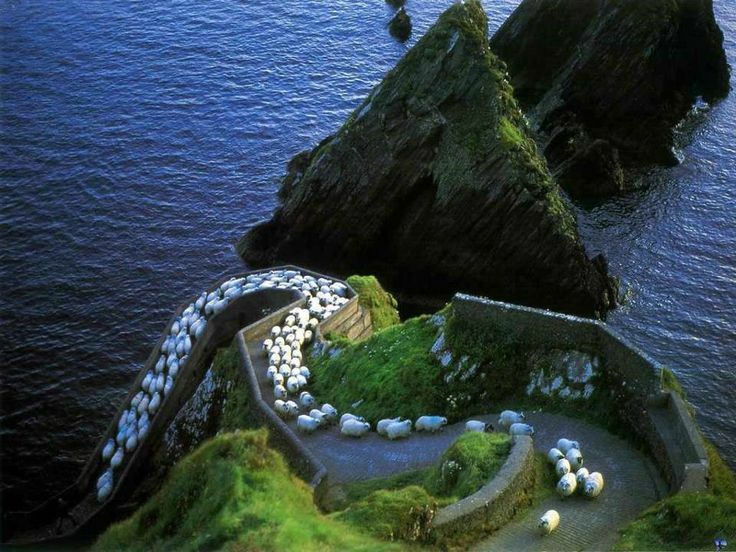 Can you just imagine those poor sheep climbing that steep hill? 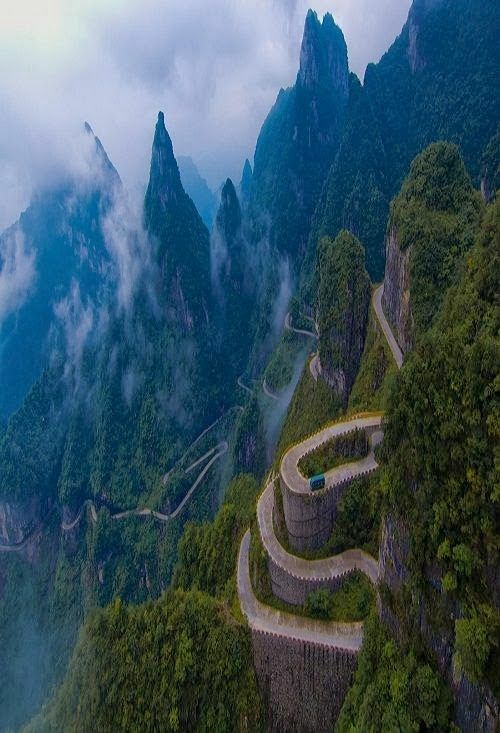 The next photo is titled Switchback Mountain, Tianman Highway, China. Can you just imagine driving on this highway? Not this fraidy cat! But the scenery is simply beautiful! If you take the trip, do take your camera with you. I can't wait to see the photos. 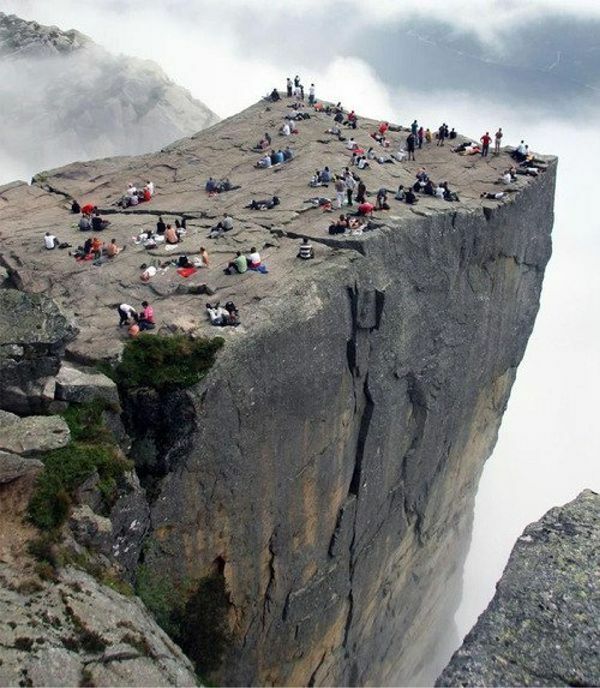 Finally, this last one is called Pulpit Rock, Norway. It looks like an awesome place for sunbathing or a picnic. For you, not me. Nope, nope, nope! I'd be on my belly crawling for the nearest path down off this rock. Actually, I'd have to be unconscious for you to get me up there in the first place. This morning Pogo's doctor called me. The test results aren't back yet, but she filled out his travel health paper and is mailing it to me. Oh thank you, thank you. Pogo has an appointment with the groomer a few days before we leave, and then he is all set to travel. DIL Janet did not come by last night because her hubby was cooking her a special dinner for Valentine's Day. (I should have thought of that!) I hope your dinner was awesome Janet. I'll see you next week. I'm waiting for some dolly bodies to come in the mail, then I'll put a couple of them right into my suitcase along with a skein of yarn. Whether or not I get to do much crocheting while on vacation does not matter. My first goal is to rest and soak up the warm temps. God willing, my friend Beth (and maybe her daughter too) will be joining Pogo and me. I surely hope so. They sure could use a break from illness and stress too. I am so looking forward to having fun in the sun (or even just out on our little screened in patio) with my friends. Stay well Beth. Florida is only two weeks away! Now I think I'll get me a cold bottle of water and do a bit of blog reading. So, till tomorrow, Y'all have a fantabulous day. I hope that you had a wonderful Valentines Day. Mine was really nice but laid back. I had some much needed sleep. I have been worried about Cisco but he seems to be on the mend. I didn't sleep well last night so I slept late today. Really late. I have my days and nights mixed up I think. Anyway Cisco didn't want me out of the bedroom this morning until I played the game with the box of bones. It was so cute. He sat by the box and put his paw on it. So he is feeling much better. Jonathan went to the doctor yesterday and Praise Be... He does not have the flu. Just a bad upper respiratory infection along with a bad ear infection. They told him to ask the pharmacy for a special kind of Sudafed. they didn't give him an antibiotic which I found really strange because of the ear infection but what do I know. I am in awe of these breathtaking places. Thanks for posting the pictures! I forgot to mention the beautiful photos. I have no trouble going up but coming down is a different story. I just couldn't do those heights tho. I would be a nervous wreck and like you I would have to be unconscious. I also forgot to wish Janice a very Happy Birthday. Hugs to you and Cisco and I hope that you have an awesome day. Beth and Cisco sends you lots of Hugs! Awesome photos and beautiful scenery, but.... I don;t think I will ever be wanting to visit those places!Brrrrrr, scary!!!! Oh great that you will have company in Florida from Beth. You will have such fun together. And wonderful that Pogo's papers are all sorted. Oh My, So Much To Do, So Little Time! Let It Snow, Let It Snow, Let It Snow. It Did! Spring Really Is Coming Soon! It's Almost Fla Fla Time!